For the past month, Mr. ThreeYear and I have been working on a big DIY project in our front yard. 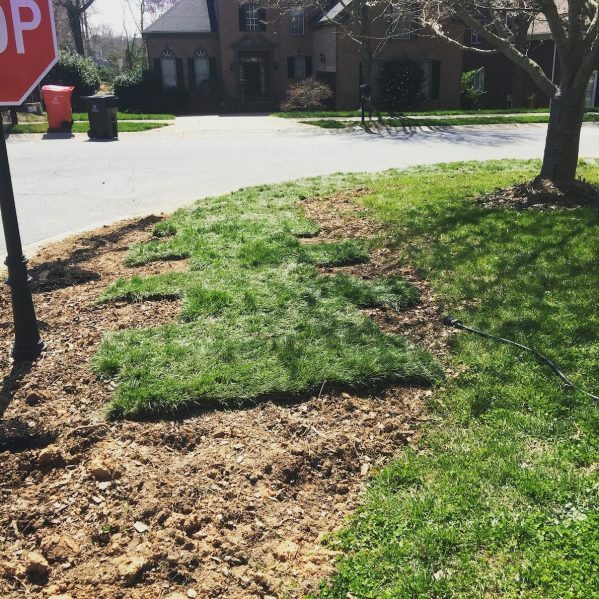 When we moved into our house in North Carolina in July, it was the height of summer, so it was way too hot to get started on any lawn projects. Unfortunately, though, our front yard had some very-neglected bushes and grass that we needed to do something with. The first thing we did was dig up some of the neglected, scraggly bushes. I got two dug up, realized how difficult manual labor was, and promptly called some yard people to give me a quote. 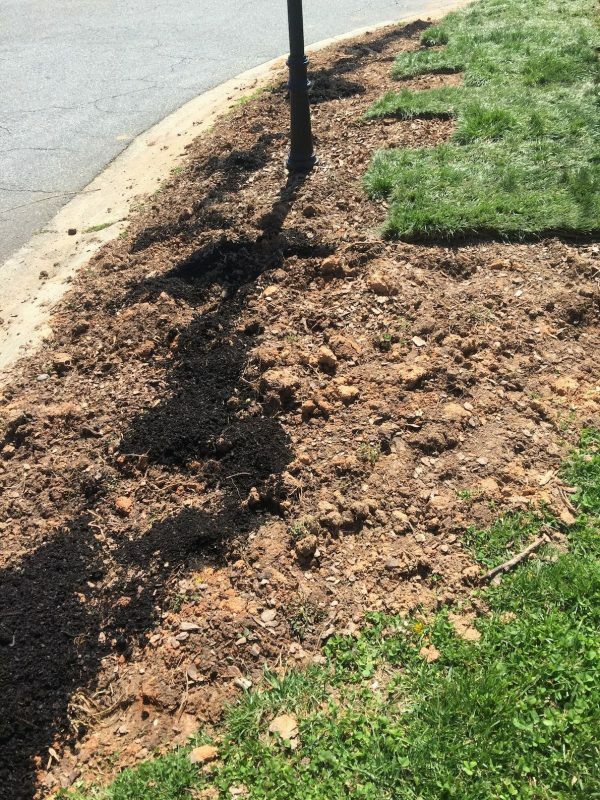 I had someone come out to give me a quote, and it was a fairly reasonable charge to remove the bushes and reseed the grass, but after he gave me the initial estimate, he never returned my texts. It was the same with several other yard crews. Apparently, the job wasn’t big enough for anyone in the landscaping industry, during a very busy time of year. So, Mr. ThreeYear and I decided we’d do it ourselves and save the money. To compress a weeks-long process into a sentence, it was very difficult to dig up the bushes. They were huge, first of all. A massive row of bushes that stood chest-high on me. First, we cut off the limbs, to make it easier to get to the root balls. Then, we spent hours systematically shoveling under the roots, cutting side-growing roots with heavy-duty clippers, and pulling the root ball back and forth to loosen it up. When we finally got a root ball out of the ground, we’d drag it over to the curb to be picked up by the garbage crew. We were left with hard clay soil that had several giant holes in it. We got out the rake and quickly realized that we’d need a tiller to loosen up the soil to be able to plant grass in it. I drove to Lowe’s and rented a tiller, negotiating a 4-hour price for a 24-hour period. It was still expensive at $54, but less expensive than the 24-hour rental would have been ($100). Since Mr. ThreeYear was traveling that day, I tilled the 500-square foot patch of dirt myself. Have you ever operated a tiller? I made sure to get one that I could handle, and made the guys at the rental shop explain how to use it in step-by-step, dumbed-down detail (I’m not known for my prowess operating mechanical things). When I got it home, I pulled it out of the Prius (a lot more fits in a Prius than you would think! ), reattached the stability bar, turned it on, and started tilling. I pushed it forward but it didn’t really seem to do much to the hard-packed clay. It was only when I pulled it back that I realized how a tiller worked. You have to pull the thing back, keeping it under control, while your arms shake like mad. Long story short, I tilled the earth. Yes, thank you, I did feel a bit like Wonder Woman. Yes, I know I might need a bit more excitement in my life, but I’m good with it. I waited for Mr. ThreeYear to get home and examine it to make sure everything looked good. We covered our clay with a small bit of topsoil (because topsoil’s expensive) and decided to buy sod to cover our patch, rather than grass seed. Part of the reason we wanted sod is because we knew it would be hard for seed to grow on that section, it would take longer, and it looked really bad. Here’s where we arrive at the crux of this post. I was in a hurry to finish the project. I wanted to get the ugly clay patch covered as quickly as possible. 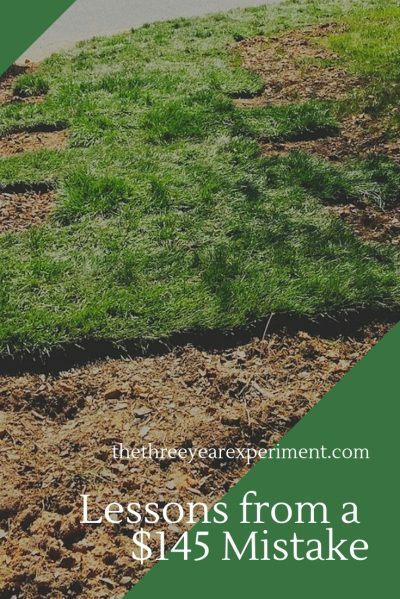 Mr. ThreeYear and I talked about how much sod we would need, and decided on 350 square feet. Did we measure? No. We estimated based on the size of our patio in the back yard. I called one sod company in the next town over, but they were closed until Wednesday. So, I called another sod company. I asked how much they charged per roll of sod, and they told me, “$8.” One roll equaled 10 square feet, so we reserved 35 rolls. I took the Honda Pilot, lined with our painting tarp, and paid for the sod. It was $280 for 35 rolls. I didn’t ask about pallet pricing. I did ask if it was cheaper to get more sod, and the woman I was working with told me it was, but didn’t give me a pricing sheet (nor did I ask for one). Well, I brought the sod home, we laid it out, and… we didn’t have enough. We needed more. Fifteen rolls more. So I called back, reserved fifteen more rolls, and went to pick them up. I paid for them ($140). That’s when I got the sheet of paper that said that it was $275 to purchase a pallet of sod. Wait, so…I could have gotten the entire 50 rolls of sod I needed for LESS than I paid for the original 35 rolls? I could have made one trip to the store and paid $275, instead of two trips and $420? (Cue appropriately aggravated mental reaction here). Was I annoyed at SuperSod of Mooresville? Yes, I was. It would have been nice of the sod company to give me that information when I asked for it. BUT, I was way more annoyed at myself. Because I didn’t take the time to find out the pricing before I drove over. I could chalk this up to another money mistake and mentally write off the $145. Which I will do, eventually. But, I think there’s something more valuable I can do with that wasted $145. I can learn from it. I can think of $145 as the cost of the lesson I learned about checking on pricing before you buy. I can make myself slow down enough next time to get *all* of the pricing information I need to make a decision. And I can call that other company the next time I need sod. Haha, I just wrote about this kind of thing too! I get so frustrated over relatively small, wasteful spending mistakes, especially when it comes from not knowing a key peace of information that someone else involved in the situation possessed but didn’t share. Glad that I’m in good company, though, and that the mistakes are getting smaller and easier to recover from as we learn more.